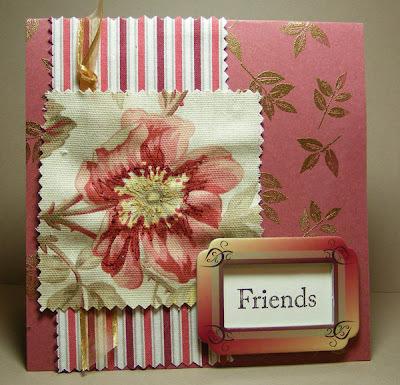 On this card that marries fabric and stamping, I have done a little 'thread painting' on the flower. Thread painting uses the free form foot on the sewing machine to allow you to hand guide the fabric and sew in any direction and stitch length. All that freedom comes with a cost. It is just plain hard to do. It is hard to get the stitch length even since moving the fabric at an even pace manually controls the stitch length and also the placement of stitches. I've done a few things with this before but I still need a lot more practice. The benefit of thread painting is you get such a unique, custom look to your creations. Also this technique is what is used to do detailed machine quilting. The gist of all this is that I need to practice, practice, practice. Oh well, at least I'm not trying to learn the piano again. I have no musical talent at all so I have far more hope for adding to my sewing skills.